I love using smoothies as a way to get more nutrition into my everyday diet. Last week I discovered a new one that has gotten me completely hooked. I don't know about you, but I'm a bit of a secret chocolate freak. I especially love dark chocolate and there is always a bag of semisweet chocolate chips lurking in my freezer in case of emergency. 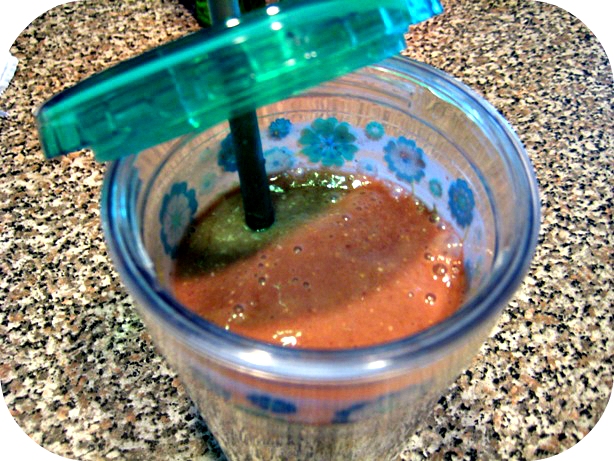 This smoothie recipe came about because I had a coupon for chocolate almond milk. Chocolate...almonds...can't really go wrong there! My local grocery store sealed the deal for me by having the milk on sale in addition to my coupon so a half gallon was only about $2. The bargain hunter in me was squealing in delight as I added it to my cart. Once I got it home I was stumped. How to use it? I didn't want to just add it to an existing recipe, so I started mentally adding and subtracting potential smoothie ingredients to my blender. This recipe is so simple and I had everything for it in my freezer and pantry. It was perfect for breakfast and the oatmeal in it kept me full and fairly alert all morning (what parent of a toddler can claim to be fully alert, right?). Add the milk to the blender first, then the frozen fruit. Blend well until combined, then add in the oatmeal and blend again to make sure everything is mixed in. Adjust consistency if needed. This makes one 12-16 oz serving.